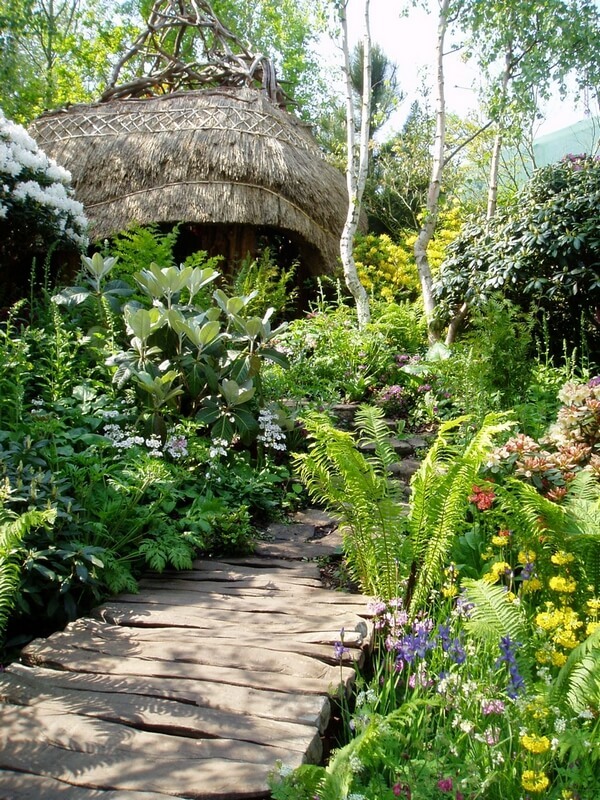 You may have noticed that every show garden at the Chelsea Flower Show this (and every) year included some sort of built structure: a summer house, ‘pod’, the back of the house or at least a pergola or arbour. There is a good reason for this and the same reason that, when I teach or talk about how to create a garden style, I ask the audience to start with a building or structure in mind. Basically it is a shortcut to defining the style or setting the scene in a garden. It is quite easy to visualise a garden round a beach hut: pebbles, g rassy plants, pale colours all appear in your mind. Or a pagoda: gold and red colours, bamboo, weeping Acer, still water, cloud pruned pines. You, literally, get the picture and decisions about paving materials, size, shape and colour of plants all become much easier as you have something to ‘match’ them to. w gardens and the theory applies to any structure or feature even a simple archway or a piece of trellis on the wall. And it is especially relevant in smaller gardens or if you want to create a different feel to an area or corner of a larger plot. In a small space you need a style shortcut; there is not room to gradually create an impression through extensive planting. Firstly, if a building has to be functional such as a shed for storage, it still needs to blend with the garden style otherwise it will detract from it: there is no such thing as neutral. Back to the seaside theme and a painted wooden shed can make a passable impersonation of a beach hut. Whereas a modern garden with strong geometric lines and limited colours might call for metal rather than wood or sleek storage boxes instead. Secondly, take advantage of the principle if you want to define a strong style by adding an architectural feature even if it is not purely functional. An arch is a good example over a pathway or simply against the rear boundary to create the impression that a small garden goes on beyond. Another ‘styling accessory’ that is also functional and will not break the bank is a bench. Think of any garden style and you will be able to find an arch or a bench in a material, shape and colour to reflect and enhance it. Chelsea here you come!